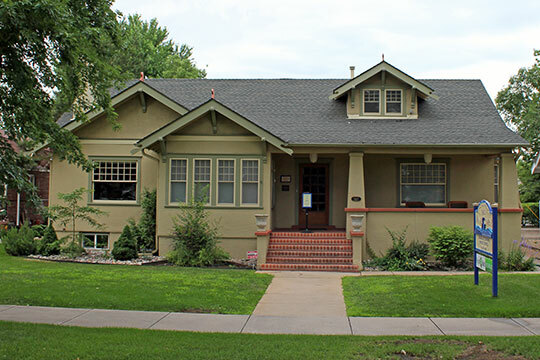 Littleton City Hall is located at 2255 West Berry Avenue, Littleton, CO 80120; phone: 303-795-3700. Photo: The Knight-Wood House, ca. 1940, 1860 West Littleton Boulevard, Littleton, CO. Listed on the National Register of Historic Places in 2004. Photographed by User:Jeffrey Beall (own work), 2011, [cc-by-3.0 (creativecommons.org/licenses/by/3.0)], via Wikimedia Commons, accessed April, 2013. Discoveries of gold and silver drew thousands to Colorado in the 1860s and 1870s, but relatively few gained great riches from mining. Some of the unsuccessful prospectors noted the agricultural potential of the territory and the expanding market for crops represented by the mining camps. A small group of early agricultural settlers established themselves in the fertile valley of the South Platte River during this period. Richard S. Little, the New Hampshire native for whom Littleton is named, arrived in Denver in 1860 to apply his engineering expertise to ditch construction. Little and his wife, Angeline, were both afflicted with asthma, and the dry, clear air of the region lured them to take up a homestead encompassing part of present-day Littleton and expand their holdings with purchased lands. The erection of the Rough and Ready Mill in 1867 by investors including Richard Little and John G. Lilley was perhaps the pivotal event that shaped the subsequent history of Littleton. The mill was the vicinity's first manufacturing enterprise and provided the nucleus for the growth of Littleton into the service center for the surrounding agricultural area. The Rough and Ready also provided the rationale for the Denver and Rio Grande Railroad's designation of Littleton as a stopping point, shipping site, and location for a depot. Historian W.H. Vickers wrote that the "mill did a good business from the first, being well supplied with excellent grain from its own immediate neighborhood, which is one of the wheat gardens of Colorado." On 8 April 1869, Littleton was formally recognized for mail delivery. Littleton's location on the mainline of a major railroad greatly improved its accessibility and may have provided the impetus for Richard S. Little's platting of the Littleton townsite. On 3 June 1872, Little filed a plat for "Littleton," consisting of that portion of the east half of the southeast quarter of Section 17, Township 5 South, Range 68 West, lying east of the South Platte River and the Rough and Ready Mill race. The plat identified eighteen numbered blocks with lots of varying dimensions and alignments. The arrival of the railroad and the town platting did not appear to immediately stimulate the growth of Littleton. The State Business Directory of 1877 listed just four businesses in Littleton that year: the Little, Lilley, and Co. Flouring Mill; Hill and Brother General Merchandise; the Bell House (hotel); and a restaurant operated by David Powers. The Rough and Ready Mill suffered two fires in the 1870s, but was rebuilt after each one. Jerome Smiley described Littleton as "a mere hamlet" by the late 1870s. By the early 1880s Littleton was served by two major railroads. In 1881, the D&RG added a third rail to the line between Denver and Pueblo, thus permitting standard gauge equipment to travel over the route. The standard gauge Atchison, Topeka, and Santa Fe Railway (AT&SF) operated its trains over the upgraded line beginning in 1881. Five listings were shown in the 1881 State Business Directory for Littleton: the flour mill, a blacksmith shop, a general merchandise store, a saloon, and a hotel. Despite the presence of the railroad at the east end of the settlement, the most intensive development remained in the western area, in the vicinity of Rapp and Main streets near the Rough and Ready Mill. The western portion of the community remained the commercial focus of Littleton at that time. The Colorado Live Stock Record in 1884 characterized the community as "a pleasant village of several years growth, ... The location of Littleton, in the midst of a large area of agricultural and grazing country, makes it an excellent business point; the climate and surrounding attract invalids from the city, and the scenery is varied and attractive." In 1885, the population of the area was estimated at four hundred, most of whom were engaged in ranching, stockraising, and truck farming. The economic tempo of the town appears to have accelerated considerably in the middle to late 1880s. In 1884, the Littleton Creamery was established by J.D. Hill and I.S. Morse. By 1888, the Creamery was processing milk from a thousand dairy cows and shipping cream and butter to Denver. In 1886, the O.G. Hill Drug Store was established on South Rapp St. (this building was moved to Main Street in 1900). An historic photograph indicates that the drug store carried a wide variety of merchandise, including drugs, paint, brushes, and window glass. The Santa Fe Railway constructed its own standard gauge track from Pueblo to Denver in 1887, resulting in two separate tracks through Littleton. The State Business Directory for 1889 showed a quadrupling of listings since 1881. In addition to the flour mill and the creamery, the 1889 directory listed a hotel, two general merchandise stores, two meat markets, one drug store, two doctors, two churches (Episcopal and Presbyterian), two blacksmiths, and two artesian well contractors. By this time, initial development had begun on Main Street. The implementation of suburban train service to and from Denver on the "Uncle Sam" served to further enhance the attractiveness of Littleton as a suburban residential location. R. Laurie Simmons and Thomas H. Simmons, historians, Front Range Research Associates, Inc., Littleton Main Street, Arapahoe County, Colorado, nomination document, 1997, National Park Service, National Register of Historic Places, Washington, D.C.